Cholla (Cylindropuntia) Cactus: Treacherous but Beautiful. In Baja California recently I was showing off my knowledge of native succulents when one “got” me. The friend who was taking a video with my phone gasped when I unsuccessfully tried to set a 3-inch-long chunk of cholla (“choy-ah”) cactus back onto a boulder. It resolutely clung to my fingers. Cholla spines have tiny, fish-hook barbs. When I tried to shake it off, the cholla hopped into a more secure position. Next I tried to remove it with my other hand, and spines stuck to that one too. Wow, what a determined little cactus! I had help removing these cholla spines. Watch the 20-second tweezered extraction. 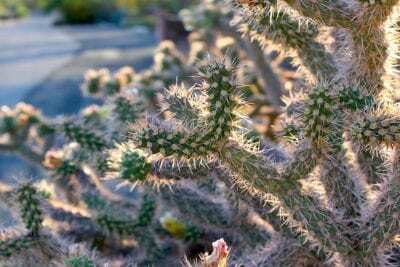 Cylindropuntia, of which there are 30+ species, are sometimes referred to as “jumping chollas” or “horse cripplers.” Like many other succulents, chollas reproduce via both seeds and cuttings. Cylindrical joints detach readily from the mother plant and cling with astonishing tenacity to whomever or whatever brushed them. They take root where they fall off, usually far enough from the original plant so they’re not competing with it for water, sun or nutrients. My Mexico experience reminded me of when I addressed the Tucson Cactus & Succulent Society, where I made the mistake of saying I don’t recommend that anyone grow cholla. “Could there be a more unfriendly plant?” I asked the group. Well, you’d think I’d insulted the entire state of Arizona. Arizona residential architecture and gardens are distinctive. Textures and colors blend to create lovely desert landscapes appropriate to the region. Cholla flowers come in all warm colors. A mourning dove nests in Cylindropuntia fulgida at the Arizona-Sonora Desert Museum near Tucson. At Tohona Chul botanic garden near Tucson. Intrigued, I went on a cholla hunt. I found this orange-flowered one at Tohona Chul botanic garden near Tucson. Not bad looking, considering it survives broiling desert heat and temperatures below freezing, with no water for months. Cholla comes in more colors than I’d assumed—not just its flowers, but even its spines and skin. The specimen of Cylindropuntia versicolor above has green, rose-red and maroon segments, and translucent, rust-red flowers. Cylindropuntia bigelovii is commonly called teddy bear cholla. Look how fuzzy it is, and its cute little ears. Like all chollas—like most spiny cacti, for that matter—it’s beautiful backlit. The flower petals of teddy bear cholla are buttery yellow tipped in rose-red. Cylindropuntia spinosoir, illuminated by late afternoon sun in a Tucson suburb, glows pink. Chain fruit cholla forms ropy, pendant strands. Doesn’t this one look like a face? 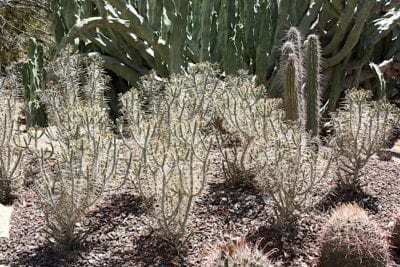 Cylindropuntia ramosissima, aka diamond cholla, has pencil-thin stems lined with glittering, translucent toothpicks. I pretended to hug Cylindropuntia fulgida, then sent this photo to my new friends at the Tucson Cactus & Succulent Society. As for my Mexico adventure, what was it about those spines that made them stick? Like those of all cacti, cholla spines are modified leaves. But cholla spines differ in that they have papery sheaths lined with microscopic barbs. Try to pull one from your skin, and you’ll discover it’s well anchored. Sure it’ll come out, but if a bit of barb remains, you’ll feel it whenever pressure is applied to the area. If that’s just too annoying, you may have to dig it out with a needle. Fortunately, “my” cholla’s spines were shallowly embeded. The only thing that stung was my pride.